The web client of TweetDeck has finally been launched as a Google Chrome app – and in many ways it is the best version of TweetDeck. Before this, TweetDeck was available for the desktop as an Adobe AIR app, for Android and iOS. However unlike competitor Seesmic, it was not available as a web app. The Chrome app looks very much like the desktop app. But compared to the desktop AIR app, the Chrome app is a lot faster, stable and consumes less system resources. Currently it works with Twitter, Facebook, Google Buzz and Foursquare. GMail support is expected to be added later. There are a few improvements over the desktop app. The blended columns are one of them. In the Chrome app, there are blended three columns called Me, Home and Inbox. The Me column lists the messages for you like Twitter @mentions, Facebook tags etc. the Home columns is a combination of all your timelines. And finally the Inbox lists all the private communications like Twitter Direct Message, Facebook messages etc. All in all, TweetDeck is a fantastic app – unlike a lot of apps which are simply bookmarks to webpages. 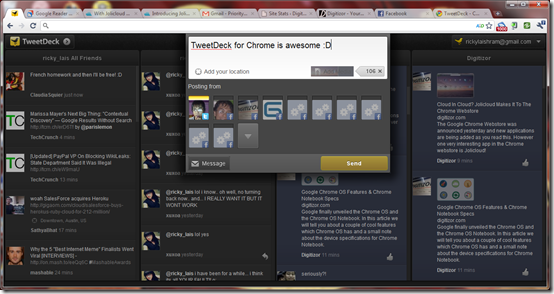 You can install TweetDeck for Chome from here.